The report "Competitive Metropolises and the Prospects for Spatial Justice: the role of metropolitan areas within the global agenda of local and regional governments for the 21st century” provides a global overview of the various realities interposed by the evolution of worldwide metropolitan areas. It aims at fostering the emergence and implementation of alternatives to those metropolitan governance models based on competitiveness and commodification, on the basis of the right to the city, right to centrality and spatial justice. The Habitat III conference process, which led to the adoption of a New Urban Agenda (NUA), was an opportunity for local governments, researchers and civil society to discuss the future of metropolises and human settlements given the context of unprecedented urban growth, which largely involves the future of humanity in terms of the environment and the realization of universal rights. Indeed, territorial inequality is still an ongoing debate which has preceded the adoption of the New Urban Agenda and which has led to a number of recommendations that new regional and national conferences are trying to translate into operational principles. On the occasion of the Habitat III process, debates materialized particularly around the question of the recognition of the right to the city, stemming from the civil society and local communities of UCLG. For its defenders, the right to the city guarantees that cities and territories are common goods where decent living and democratic participation are at the heart of all concerns. This report has therefore been conceived as a contribution to this process by the LAVUE Center, in collaboration with the UCLG Committee on Social Inclusion, Participatory Democracy and Human Rights and Plaine Commune. 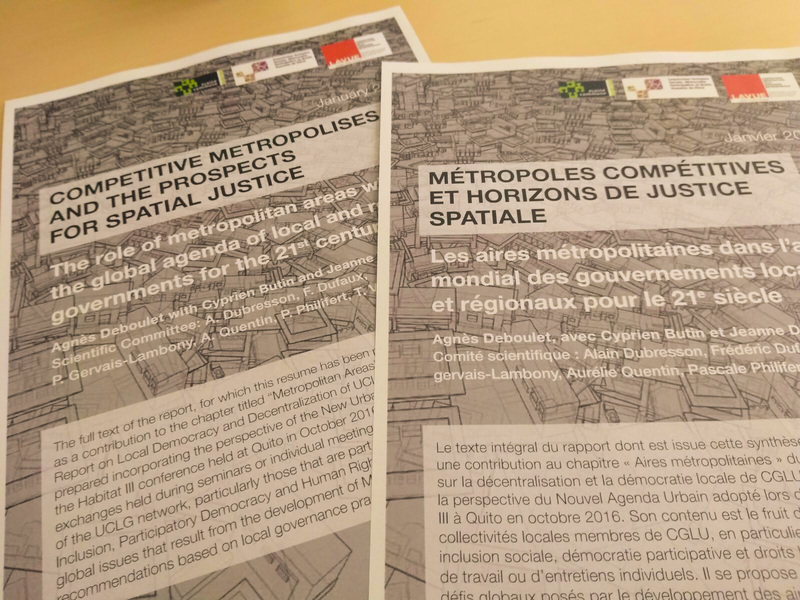 It is the result of a dialogue between researchers and elected officials of UCLG aimed at establishing a clear diagnosis of the challenges posed by the development of global metropolization, offering recommendations based on local practices of metropolitan governance.